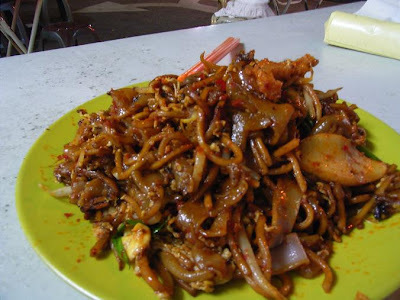 Jalan Ipoh, has many places that hosts some nice eateries. We were at one recently which we drive past quite often but have not had the time to go. 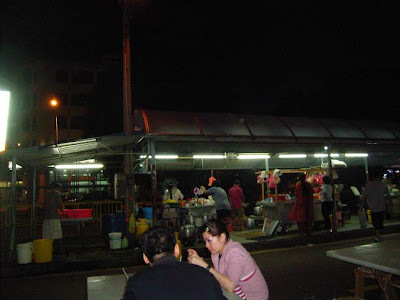 Its at Taman Million , this stall is famous for serving nice and delicious noodles. I have had the pleasure of eating at this stall since, 1999. This noodle stall is situated at the corner of the children's play ground, right outside of the stationery shop, facing Jalan Ipoh. I have been here many times but not recently. Fried Kuay Teo, must add Mee.... alamak.. I ordered Char Kuay Teo ( I remember very nice, and taste like Penang style wan). 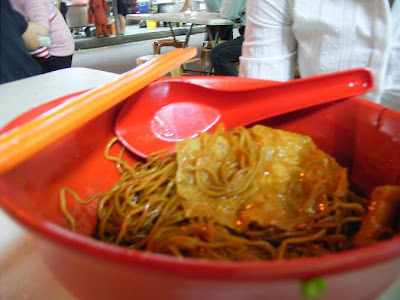 The lady exclaimed, " Kuay Teo only boh la.... only got Kuay Teo Mee...." Since no choice liao had to order that lor. I used to just eat their Curry Mee, but since we only had the tummy to eat one serving , so Curry Mee here will have to wait until the next time we come here again. Oh ya , if you see a Satay Stall next to this place, don try it. The uncle burnt all my sates... yucks!! The blog above managed to get CKT... she calls it Jln Ipoh CKT. Now no more liao... CKT must add Mee wan... cipek !! !